Water models talk topography, land surface models talk grids. Choosing a common language was important, according to researchers at Pacific Northwest National Laboratory, because land surface models must also represent hydrology in Earth system modeling. To simulate water runoff and river flow, the team showed that dividing the area into units based on subbasins defined by topography—the computational unit used by water models—makes land surface models more robust across different spatial resolutions versus the uniform grid-based units. Topography has a dominant control on processes that determine freshwater supply. Traditionally, hydrologic models are designed to represent the variety of hydrologic processes within computational units defined by topographic boundary of watersheds or subbasins. However, land surface models generally define their computational units using simple rectangular grids to facilitate exchanges with atmospheric models that share the same grids. To understand the scalability of both, the PNNL researchers implemented the subbasin approach in the Community Land Model (CLM) coupled with the Model for Scale Adaptive River Transport (MOSART) for comparison with the model’s current grid-based approach. They performed simulations in the large river basins with diverse climate and hydrology using model resolutions ranging from 1/8 to 1 degree. For each approach, they evaluated the differences between the coarser resolution hydrologic simulations and the simulations at the highest resolution of 1/8 degree. They found the coarser resolution simulations using the subbasin approach approached the high-resolution simulations faster and more consistently as resolution increases than simulations using the grid-based approach. Their in-depth analysis showed that the scalability advantages of the subbasin approach are related to a combination of improved atmospheric forcing and consistency of runoff generation and the routing processes across spatial resolutions. Water, land, air. Scientists develop numerical models to simulate how these systems operate and use them to predict how the systems respond to natural and human-caused changes. Testing “what ifs” is complicated by modeling results that change with the size of the computational grids, which is limited by the available computational horsepower. Researchers are striving for the most system complexity possible. Faithfully simulating water system processes requires allegiance to topography, those divisions of landscape such as mountains, valleys, and land cover. These are the natural boundaries that influence the water system’s response to climate change. By adopting computational units based on the natural boundaries scientists tag as subbasins the researchers solved an important challenge and enabled hydrologic processes to be more robustly simulated across a range of model resolutions. Their findings also facilitate understanding of the many processes that control freshwater supply. This research shows the way to more robust water system simulations at regional and global resolutions. Representing spatial heterogeneity and lateral land surface processes is important for simulating surface energy and water exchanges in Earth system models. Researchers, led by Department of Energy Scientists at Pacific Northwest National Laboratory, developed a subbasin-based framework in which subbasins are represented on a pseudo-grid matrix in the Community Land Model (CLM), which is the land component of the Community Earth System Model (CESM). Lateral routing of water within and between subbasins was simulated with the subbasin version of a recently developed physically based routing model, the Model for Scale Adaptive River Transport (MOSART). They tested the framework in the topographically and climatically contrasting regions of the U.S. Pacific Northwest and Midwest and compared it to the traditional use of regular grids. The relative merits of the two modeling frameworks were evaluated based on their scalability (i.e., ability to perform consistently across spatial resolutions) in simulating streamflow. Comparison of the two frameworks at the finest spatial resolution showed that small difference between the averaged forcing could lead to larger difference in the simulated runoff and streamflow because of nonlinear processes. 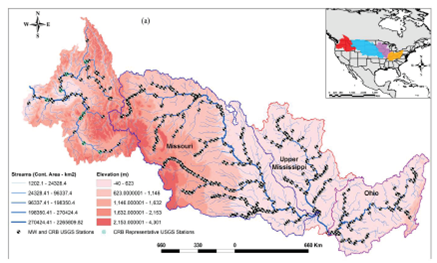 They conducted more systematic comparisons using statistical metrics calculated between each coarse resolution and the corresponding 0.125° resolution simulations which showed superior scalability in simulating both peak and mean streamflow for the subbasin-based over the grid-based modeling framework. The analysis showed that the subbasin approach scalability advantages are driven by a combination of improved consistency in runoff generation and the routing processes across spatial resolutions. Tesfa, TK, L Leung, M Huang, H Li, N Voisin, and MS Wigmosta. 2014. "Scalability of Grid- and Subbasin-based Land Surface Modeling Approaches for Hydrologic Simulations." Journal of Geophysical Research - Atmospheres, doi:10.1002/2013JD020493. Tesfa, TK, HY Li, LR Leung, M Huang, Y Ke, Y Sun, and Y Liu. 2014. "A Subbasin-based Framework to Represent Land Surface Processes in an Earth System Model." Geoscientific Model Development 947-963, doi:10.5194/gmd-7-947-2014. The U.S. Department of Energy Biological and Environmental Research supported this research as part of the Earth System Modeling Program, Regional and Global Climate Modeling Program, and Integrated Assessment Research Program. Development of input data and the CLM and MOSART simulations received support from the PNNL’s Platform for Regional Integrated Modeling and Analysis (PRIMA) initiative, a Laboratory Directed Research and Development program.